Appears to be a good price - 5 year warranty included. The Philips 50PUS6703 Ultra Slim 4K UHD LED Smart TV will be the envy of all your friends. With Pixel Precise Ultra HD giving you smooth, sharp picture quality add with access to SAPHI which is Philips TV dashboard allowing you access your favourite apps at the click of a button. And you cannot forget Ambilight. Philips have installed intelligent LED’s around the back of the TV that projects the on-screen colours onto your wall, giving the impression of a large screen. It also reacts to music so whether you enjoy music while you are doing some housework or have some friend over for a dinner party the Ambilight technology can make your room feel like a you are in a club. The Ambilight feature can also be used when you are not watching television, it can act as a lamp while you are relaxing on your sofa with a book or sharing a beverage with your friend or family, giving off calm, relaxing colour after a long day. Expand your viewing experience with 3-sided Ambilight. Only Philips TV takes the emotion beyond the screen with ambient lighting that perfectly matches every scene. Watch your favourite film come to life with vibrant colours for a truly immersive visual feast. With four times the resolution of conventional Full HD, Ultra HD lights up your screen with over 8 million pixels and unique Ultra Resolution Upscaling technology. Experience improved images regardless of the original content, and enjoy a sharper picture with superior depth, contrast, natural motion and vivid details. The beauty of 4K Ultra HD TV is in savouring every detail. Philips Pixel Precise Ultra HD engine converts any input picture into stunning UHD resolution on your screen. Enjoy a smooth, yet sharp moving image and exceptional contrast. Discover deeper blacks, whiter whites, vivid colours and natural skin tones - every time, and from any source. High Dynamic Range Plus is a new video standard. It redefines in-home entertainment through advances in contrast and colour. Enjoy a sensory experience that captures the original richness and liveliness, yet accurately reflects the content creator’s intent. The end result? Brighter highlights, greater contrast, a broader range of colours and detail like never before. Micro Dimming Pro optimizes the contrast on your TV based on the lighting conditions of your room. Combined with its special software that analyses the picture in 6400 different zones, you will enjoy incredible contrast and image quality for a truly lifelike visual experience-day or night. Saphi simplifies complex smart TV options. Now, all you need to do is select the ‘home’ button on your remote for a clear, intuitive menu system that lets you find the option you need faster. Philips app gallery is a wide-ranging collection of online apps that you can access as soon as your Smart TV is connected to the Internet. It’s that easy! Just switch on your TV, connect to the Internet and experience a whole new world of entertainment online. Freeview Play combines catch-up, on-demand services and live television together in one place with no monthly costs. Find programmes from BBC iPlayer, ITV Hub, All 4, Demand 5 and UKTV Play sitting alongside 70 TV channels and 15 HD channels. The Philips app gallery also gives access to video-on-demand apps, web browser and Miracast. I guess that depend on whether you have a membership already or not. Might be worth the extra cost for the warranty mind. Still waiting on 7 series reductions. Agreed, c’mon the 7 series... a wee 55” will do me dandy! Remember that you need to have an active Costco membership for the full duration of the warranty period. I double checked this in store last week. Is the picture difference on the 7 series worth an extra £200. Was looking at the Hisense H50A6200UK as I have vouchers to spend at curry’s . Is this Phillips a better TV ? 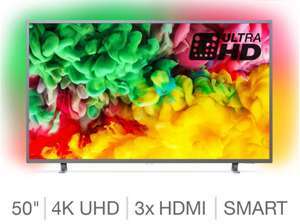 Was looking at the Hisense H50A6200UK as I have vouchers to spend at …Was looking at the Hisense H50A6200UK as I have vouchers to spend at curry’s . Is this Phillips a better TV ? If you have Phillips hue, or like the ambilight or want to hook it up to sync with win 10, when you fine tune and tone down the ambilight effect, it's great, this TV wins hands down. I got this from the deal Richer Sounds had on with the 6 year warranty. If you have Phillips hue, or like the ambilight or want to hook it up to …If you have Phillips hue, or like the ambilight or want to hook it up to sync with win 10, when you fine tune and tone down the ambilight effect, it's great, this TV wins hands down. Just to say, I have the 7000 series, and the remote, although feels solid, the software is a little bit clunky, compared to the lg in another room, try and have a play in store, however, the ambilight, somehow enhances the picture, and I found softening the effect, lessened the in yer face, gimmick effect, and made it a subtle enhancement, I have it on when watching any TV, but comes into its own, when watching a blockbuster, esp sci fi! Some folks may like it full on, but there are loads of adjustments, for music, video, static ect. This one or Samsung nu7400? Had the 65pus7601 for around 6 months. I loved it but it ended up switching hdmi itself or black screen every 30 minutes or so. Ive also got this 50pus6703 model in the bedroom. It's going the same way. While watching HDMI sources or even built in netflix app I get no signal warning and shutdown timer. It's a pain and I'm hoping one day it completely dies so I can justify getting something else. Really disappointed with philips and wouldn't have another. Remember that you need to have an active Costco membership for the full …Remember that you need to have an active Costco membership for the full duration of the warranty period. I double checked this in store last week. I'm just going by what Costco customer service told me in store. 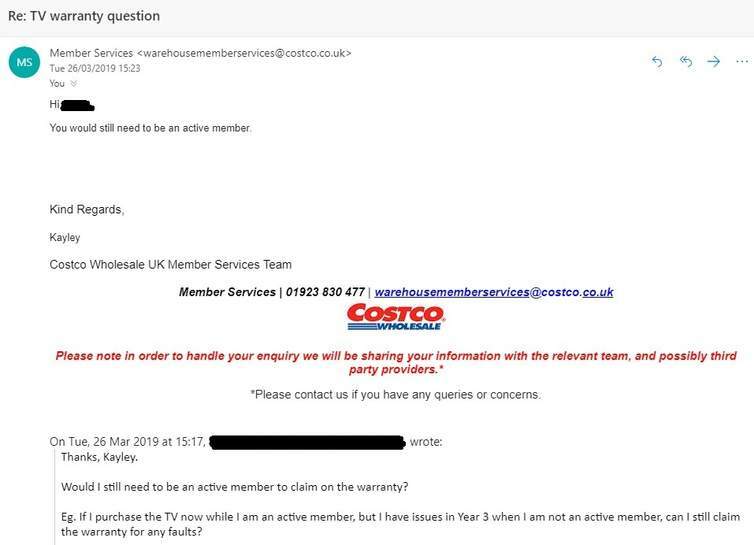 I think I'll email Costco head office and get an official response from them as it sounds like the different customer service staff on the day probably just don't know and have threw out an answer. I'll come back and confirm once they get back to me. Oh god please don't let this thread end up 8+ pages long like the other 20 or so threads on the exact same model. Has it not been cheaper? Can you use the ambilight with a PS4? Is this any good for gaming ? Walked into Costco yesterday to see if they stocked this in store, they didn’t. Called Richer Sounds, popped by and got it for £385 price matched plus the 6 year warranty. I have noticed that the corners of the screen is darker than the actual picture. not sure if this is normal for this TV and its panel??? Got mine and a Yamaha soundbar for £630 having struck a deal with the Director at Richer Sounds, Belfast. Ordered it Thursday, arrived this morning. On the off chance anybody might be interested it is possible to retrofit an Ambilight kit to your existing telly as it is something I’ve been researching. Another option but this is more for those just wanting colours to reflect the back of the tv is to fit an led strip, works quite well and uses the USB port on the tv to power on & off in sync with your tv. You also get a remote for changing colours etc, around £12 on amazon, check your screen size carefully though if you want it all the way round ..
That’s the name they have went with, ‘the one’. I think I'll email Costco head office and get an official response from …I think I'll email Costco head office and get an official response from them as it sounds like the different customer service staff on the day probably just don't know and have threw out an answer. I'll come back and confirm once they get back to me. Here we go - confirmation that you need to be an active member for the full 5 years of the warranty period. So for people who will be creating memberships just to buy a TV, it won't be worth it as you'll need to add 5 years worth of membership fees onto the TV price (which is approx ~£150). For people who have a membership anyway then happy days. [Image] Here we go - confirmation that you need to be an active member for …[Image] Here we go - confirmation that you need to be an active member for the full 5 years of the warranty period. So for people who will be creating memberships just to buy a TV, it won't be worth it as you'll need to add 5 years worth of membership fees onto the TV price (which is approx ~£150). For people who have a membership anyway then happy days. Useful to know, but in fairness that email doesn’t say you need to have had full membership for the duration you’ve had the tv. Just you need to be an active member which I would read as having an active membership at the time the fault occurs. Thanks for taking the time to have it checked out though - maybe reply to that email to say put another way if I buy a particular tv in year one but don’t renew my membership in years 2 & 3 but a fault appears in Year 3 and I renew my membership before I report the fault the warranty must still be valid? See what they say to that.. I think you’ll find the reply will be clear in that as long as you have an active membership the warranty on the tv is covered.